What happens to the Brain when it gets injured? When you head gets hit by something, or the head is abruptly stopped or sped up, physical forces and energy are transferred from the head and brain. This can result in injury. A HEAD INJURY refers to a traumatic injury to the head, and could result in a fracture to a bone in the skull or face, or bruises or cuts to the head or face. A head injury many or may not include a brain injury. A CLOSED HEAD INJURY is one in which there is no penetration or opening from the outside through the skull. This is the most common type of head injury. It’s also the type of head injury that we refer to mostly in this edition of the Goldfinger Guide. You will see these head injuries frequently in car accident cases. They can exist where the impact to the vehicle is severe, or not so severe. 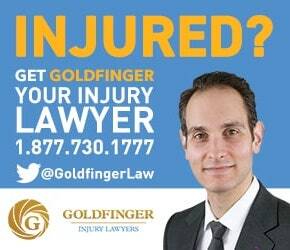 Goldfinger Injury Lawyers also sees these sort of injuries in whiplash car accidents whereby clients have their heads lean forward and then slam onto the steering wheel or the back of a head rest. In contrast to the Closed Head Injury is the OPEN HEAD INJURY. Picture an open wound to the head. There is penetration or exposure to the skull. In a car accident case, where the skull is fractured, and the brain or parts of the brain are exposed to the open air, it’s referred to as an OPEN HEAD INJURY. The term TRAUMATIC BRAIN INJURY is obviously the specific one to used when the brain is involved. However, specifying whether there was an open or closed head injury is also very important for doctors, and for lawyers alike. This is because it clarifies the type of TBI that is likely to be associated with the head injury. The TBI associated with a closed head injury is more likely to be diffuse- meaning it affects multiple areas throughout the brain. The TBI associated with an open head injury is more likely to be focal- meaning it affects a localized area of the brain. When describing an accident victim’s brain injury, it’s important for lawyers and doctors alike to specify whether or not it’s an open or a closed head injury.